Did you know that too much sun exposure is bad for your dog? Most pet owners know the dangers of heat stroke for canines, but many don’t realize that dogs can also get sunburns and suffer from different forms of skin cancer. A thick layer of fur does help keep the UVA and UVB rays off your dog’s skin, but there are some areas of the body that don’t have as much fur. Your dog’s ears, muzzle and belly are all at a greater risk of being sunburned. Much like people, too much sun exposure can lead to skin ulcers, painful sunburns, multiple types of skin cancer and permanent skin damage. Breeds with short hair, fair skin and those with light colored noses are more at risk than others. There are many different types of sunscreens that are made specifically for dogs. These creams are formulated to be compatible with a dog’s skin, which has a different pH than human skin. Keeping your pet indoors during peak sunlight hours is another simple way to ensure he is safe from UVA and UVB rays. Most dog owners do not think of covering their dog with clothing to protect him from the sun. Usually when we think of heat stroke and sunburns we’re thinking about the hot summer months. You don’t want to put any clothing on your dog that may make him even hotter – unless it’s a Sun Shield Tee from Gold Paw Series. These doggy t-shirts are made of a lightweight stretch jersey material that has a UPF50 rating to block 98% of the sun’s harmful UV rays. 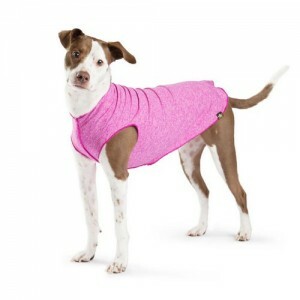 The shirts are breathable and comfortable, so it won’t increase your pet’s body temperature. The company can even add sleeves if you need them. Sun Shield Tees come in 15 sizes and 7 colors. You can see the company’s website for specific sizing instructions, but they are made to fit virtually any dog from a tiny teacup Chihuahua to a St. Bernard. These shirts can be worn indoors or outside, and they’re machine washable for easy cleaning. Gold Paw Series says the shirts can be used for many things beyond just sun protection. They cover your dog’s undercarriage and rear end, so they’ll keep him from chewing or scratching at any skin conditions or wounds that need time to heal. They claim that they can also be used as an effective calming aid for dogs suffering from anxiety. Depending on the size your pup requires, you can pick up a Sun Shield Tee for $20-$37. That sounds like a lot for a doggy t-shirt, but consider the money you’ll be saving on health care. According to CanineCancer.com, skin cancers are the most common form of cancer in dogs. Not all forms are caused by sun exposure, but skin damage from the sun is a big factor.